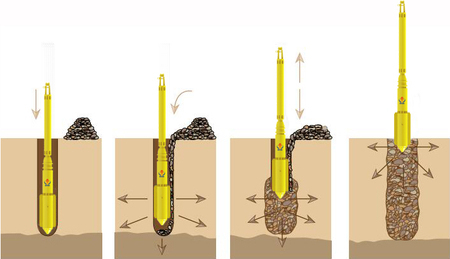 The top feed vibroflotation method consisting of firstly the rig or prob is positioned at the point on the ground surface where the compaction or stone column is desired.Then the combined influence of the intensive water jet and vibration enable the prob to penetrate into the soil. This process is allowed to design depth and resulting cavity is filled with material such as coarse chipping,aggregate,gravely sand. The required interaction between the stone column and surrounding soil is developed by the stone infill being compacted. 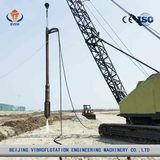 The bottom feed vibroflotation probe suspended crawler crane or leader has a gravel feeling pipe connected with side of the prob and also a gravel bucket for filling the gravel hopper which is movable up and down using with crane ropes or leader ropes as an optional. 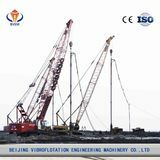 Positioned vibroflotation prob suspended from a crawler crane or leader allows it to penetrate the soil simultaneously by injecting water or compressed air up to the desired depth. When desired depth has been reached, the vibroflotation prob pulled up around 1 m and upper gate of gravel pipe opened and the hole created by vibroflotation probe filled by gravel. 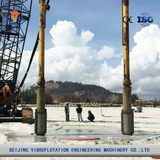 The vibroflotation probe lowered down until the gauge of hydraulic power pack or electronic data logger indicates that the specified compaction pressure has been reached. This process is repeated until the vibroflotation has either been extracted completely from the soil or else until its head has arrived at the upper side of the formation that is to be compacted. 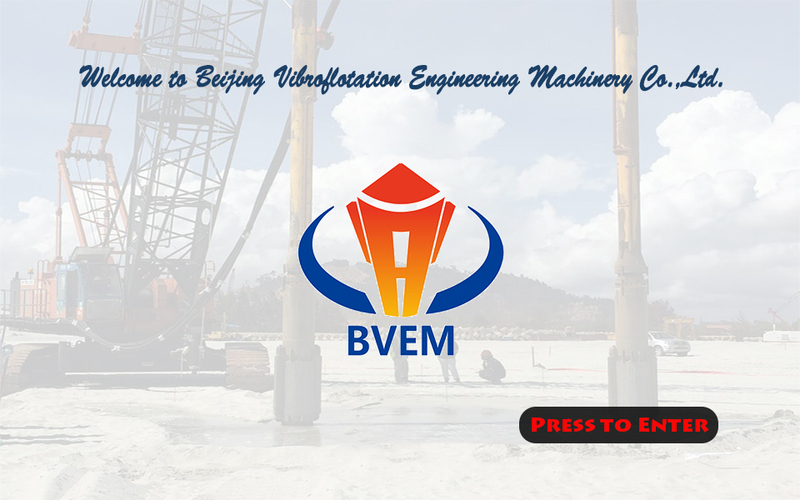 Beijing Vibroflotation Engineering Machinery Co., Ltd(BVEM),is loated in China. 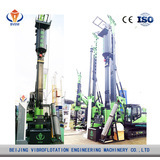 It’s a professional vibroflot team of manufacturing, equipment R&D design and construction. 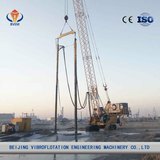 With the equipment R&D driven by construction, project promoted by the equipment, our company has grown fast in the vibroflotation industry, and has taken over several medium-sized vibroflotation stone column construction projects, has won recognition and praise by excellent construction quality. Through our unremitting efforts, we are honored to be named “Asia's larger manufacturer of electric vibroflot complete sets of equipment”and “China electric vibroflot device specification editor unit”. 2019-04-18BVEM International Department welcomed two members of visitors in this spring. 5th Aug,2018, BVEM was invited to visit the UAE foundation treatment company. 2018-05-23Sao Paulo,Bzail,M&T EXPO,2018,BVEM waits for you here.